Lama Zopa Rinpoche offers a silver Dharmachakra via video to His Holiness the Dalai Lama from Kopan, Nepal in May 2013. Rinpoche later offered it in person to His Holiness in Dharamsala, India on June 10, 2013. 2012 Merit Box Grants Awarded! 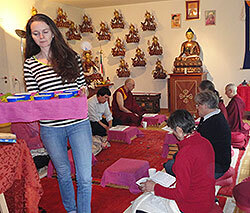 Students at Longku Centre in Bern, Switzerland liberated worms for Rinpoche’s health and long life, May 2013. Photo courtesy of Longku Centre. Thanks to all who have done and are continuing to do the practices recommended for Lama Zopa Rinpoche’s health and long life. Please continue to do these practices, and send Claire your totals at the end of each month. The Tendil Nyersel prayer flags will be ready soon. 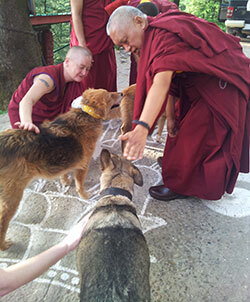 Lama Zopa Rinpoche blessing dogs on Saka Dawa at Tushita Meditation Centre, Dharamsala, India, May 2013. “I heard of the difficulties you are facing in the center. It is very important for a leader to have humility, kindness, be humble in manner, always express appreciation: we are serving others, so always be generous in attitude towards others, this is so important. As a leader and director, this way we create a lot of merit as well. And we shouldn’t see/do this as ‘black politics’ – for something in return for self. This is naturally what we should do to be in harmony. After Lama Chöpa at Tushita Meditation Centre, Lama Zopa Rinpoche requested Rangjung Neljorma Khadro Namsel Drönme (Khadro-la) to give a short talk, but Khadro-la took on a very shy aspect and said she couldn’t, India, June 2013. We have redesigned fpmt.org with the aim of making it easier for you to discover FPMT news and connect with Lama Zopa Rinpoche, FPMT International Office (and its extensive collection of resources for students, centers, projects and services), and the broader FPMT organization. We hope you like it and find it more user-friendly. 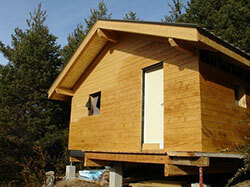 Thakpa Kachoe’s retreat chalet in the French Alps, under final construction, was awarded a 2012 Merit Box grant. Canada; repairs to a study group’s gompa with flood damage in Argentina; a soup kitchen and health clinic in Mongolia; propane for long-term retreaters in California, and more. We invite you to enjoy this full list of all Merit Box grants this year and rejoice! Turn your spare coins into stupas, retreat cabins and translations of sacred texts! Join the International Merit Box practice by ordering a FREE Merit Box through the Foundation Store or become a Merit Box coordinator for your center, project, service or study group. As you can see by the grants above, our loose change brings a lot of merit! Composed in 1673 by the Fifth Dalai Lama, this text is an extensive rite for the practice of the Seven Medicine Buddhas, Buddha Shakyamuni, and an assembly of bodhisattvas and guardian deities. Previously available only in hardcopy, this practice is now available in eBook format. This collection of prayers by Gung-thang Konchog Tanpai Dronme and Changkya Rolpai Dorje is meant to be read in conjunction with the sadhanas of Gyalwa Gyatso. For those with the initiation of Gyalwa Gyatso who wish to strengthen their practice, this collection is essential. In eBook, booklet letter and A4 formats. In addition to all the material available in the members area of the FPMT-Hispana website, nine essential books are currently available through Ediciones Mahayana, with plans for many more to be published soon. FPMT Spanish Translation Services is currently finishing the modules of Living in the Path and all the auxiliary materials of the Basic Program. Sera Je Monastery monks performing pujas sponsored by the Puja Fund. The range of pujas and practices that are sponsored in India, Nepal and elsewhere around the world through the Puja Fund is astounding. 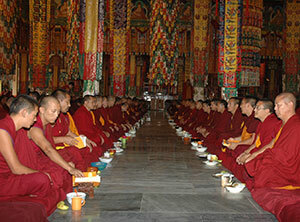 Offered on auspicious days when virtuous karma is increased by as much as 100 million times, Sangha read extensive dedications prepared by Lama Zopa Rinpoche, and offer the merit to the long life of His Holiness the Dalai Lama and Lama Zopa Rinpoche, and to the removal of obstacles to FPMT’s Dharma activities. Merit is also dedicated to FPMT students, benefactors of centers, projects and services and their families, to all who have passed away, and especially to the benefactors of the Puja Fund. 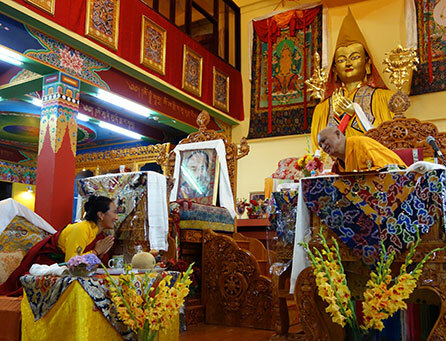 Recently, Lama Zopa Rinpoche reviewed all the ongoing pujas – and quintupled the pujas offered! The annual cost of pujas offered is now approximately US$80,000! This is something amazing to rejoice in and for you to mentally offer and dedicate. Also you can participate in this by donating any amount. How wonderful! By contributing to the Puja Fund you become part of the incredible continuous practice of pujas offered by thousands of monks and nuns around the world for the benefit of all. This year in May, on Saka Dawa, the Puja Fund sponsored the following offerings on advice from Lama Zopa Rinpoche. Mandala July-September 2013 is on its way to Friends of FPMT. The magazine features full coverage of Lama Zopa Rinpoche’s recent tour of centers in Taiwan, Singapore, Malaysia and Hong Kong. Also in this issue, Maitripa College and FPMT International Office host His Holiness the Dalai Lama and His Holiness the Sakya Trizin during their respective visits to Portland, Oregon, USA. Plus a rich collection of teachings, news and personal stories to inspire practice and support a vibrant FPMT international community. 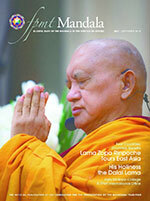 By signing up now to become a Friend of FPMT at the Basic level or higher, we will send you this issue of Mandala as well as an email with a link to the electronic version, which you can read right away. 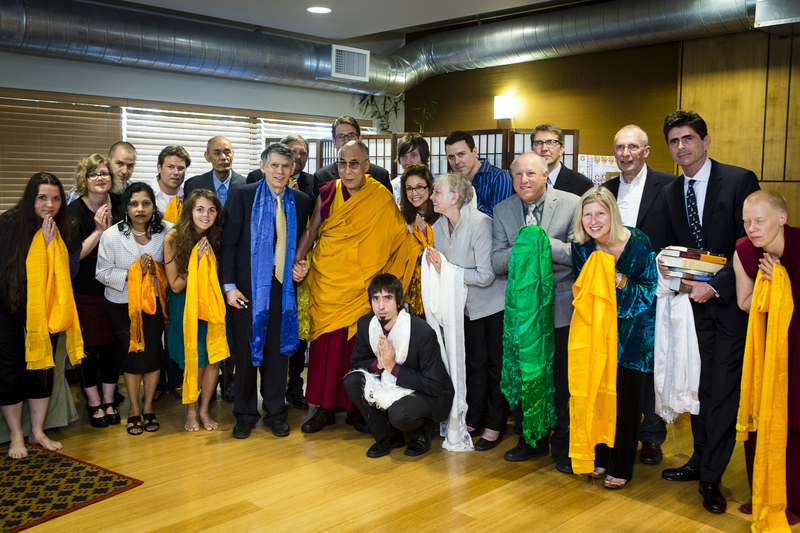 For more, visit us online at fpmt.org/mandala – and we hope you like our website’s new look. Lama Zopa Rinpoche had planned but was then unable to attend the recent North American Regional Meeting in May, so Rinpoche sent a video message instead! It is highly recommended for all offering service in centers, projects and services to enjoy Rinpoche’s thanks and wishes for us to achieve realizations. “My most dear directors, SPCs, teachers, friends, supporters, benefactors, so everybody, most precious and most kind and most dear and wish-fulfilling; to everyone, thank you very, very, very much. Thank you so much, billions and zillions and trillions for your long-time dedication, sacrificing your life, body, speech and mind, to the organization – preserving Mahayana teachings and spreading – not so much converting as enlightening – bringing in the sun in the minds of the sentient beings of the six realms. The sun of the teachings of the Buddha in the minds of sentient beings of the six realms, particularly human beings, devas, animals in this world, dispelling the darkness of ignorance from where all samsaric suffering comes, global problems come, country problems come, society problems come, all the family problems come, individual problems come. [All these problems come] from ignorance, from beginningless rebirth, unbelievable, unbelievable, unbelievable, unbelievable, unbelievable suffering, beginningless, beginningless samsara. We have been helping sentient beings, from whom all of our happiness from beginningless rebirth, present, future, even future lives, comes. In the world, generally people think only of the happiness of this life, just only this life, can be a few years, some months, some weeks, days. So just this is very temporary, completely nothing, just suffering. Can never get satisfaction. Nothing. It’s very, very sad; it’s very, very, very, very, ignorant. CPMT 2014 will run from September 13-19, 2014 in a unique venue – The Great Stupa of Universal Compassion, Bendigo, Australia! It will be hosted by the Great Stupa, Atisha Centre and Thubten Shedrup Ling Monastery. Please mark your diaries and plan to attend! Further information will follow regarding the agenda and how to book. Every year we celebrate our ordained Dharma brothers and sisters on the day marking the First Turning of the Wheel of Dharma, which this year falls on July 12, 2013. Please plan your International Sangha Day event now! Also this is the day for your center, project or service to make its annual donation to the Lama Yeshe Sangha Fund. “LRZTP 6 is now more than halfway through the first year. Our 14 students are studying very hard and have made amazing progress since they enrolled. They can all talk, read, write and even discuss Dharma! They all seem very committed and enthusiastic, and they are a very good team. The Jade Buddha for Universal Peace (a project of the Great Stupa of Universal Compassion) is looking for a tour manager; Vajrapani Institute, USA is looking for a full-time land manager; and Root Institute, India needs various volunteers. “As far as I am concerned, the FPMT family is the best and more profound I could have in all my lives, and our Most Precious Lama Zopa the best, the kindest, the most compassionate lama I could ever find in the whole Universe.” – Angeliki, ex-study group coordinator.